Sweeney Todd – Liverpool Everyman – Musical Director. dir. Nick Bagnall. Punch & Judy – Simple8 at the Soho Theatre – Musical Director. dir. Sebastian Armesto, Composer; Julian Bleach. The Prince & The Pauper – The Watermill Theatre – Composer. dir. Abigail Pickard Price. Can’t Wait for Christmas! – Orange Tree Theatre – Composer. dir. Imogen Bond. Don Quixote – Garrick Theatre, West End – Musical Director. dir. Angus Jackson, Composer; Grant Olding. Pericles – Olivier Theatre, National Theatre – Musical Director. dir. Emily Lim, Composer; James Fortune. Miss Littlewood – Swan Theatre, Royal Shakespeare Company – Musical Director. dir. Erica Whyman, Composer; Sam Kenyon. The Fantastic Follies of Mrs Rich – Swan Theatre, Royal Shakespeare Company – Chris / Musical Director. dir. Jo Davies, Composer; Grant Olding. Tarek also MD’d & performed on the RSC Original Cast recording for Miss Littlewood, ran a musical workshop as part of the NT Connections Programme, and conducted The Duchess of Malfi as cover MD for the RSC Swan season. Arabian Nights – Edinburgh Lyceum – Composer & Musical Director. dir. Joe Douglas. The Borrowers – The Watermill Theatre – Composer & Musical Director. dir. Paul Hart. Our Town – Manchester Royal Exchange – Simon Stimson / Musical Director. dir. Sarah Frankcom, Composer; Ben & Max Ringham. Gulliver’s Travels – YMTUK; Lyric Theatre, Belfast – Musical Supervisor. dir. Des Kennedy, Composer; Duke Special. Twelfth Night – Manchester Royal Exchange – Valentine / Musical Director. dir. Jo Davies, Composer; Alex Baranowski. Anita and Me – Birmingham Rep/UK Tour – Musical Director. dir. Roxana Silbert, Composer; Ben & Max Ringham. Red Roses for Me – Workshop – The Watermill Theatre – Musical Director. dir. Chloe France. Alice in Wonderland – Site Specific Performance. Bolton Octagon Theatre – Composer & Musical Director. dir. Elizabeth Newman. Extra Yarn – Orange Tree Theatre – Musical Director. dir. Imogen Bond, Composer; Tom Deering. Sleeping Beauty – The Watermill Theatre – Composer & Musical Director. dir. Bill Buckhurst. The Grinning Man – Bristol Old Vic – Musical Director. dir. Tom Morris, Composers; Marc Teitler & Tim Phillips. A Midsummer Night’s Dream: A Play for the Nation – RST & UK Tour, Royal Shakespeare Company – Musical Director. dir. Erica Whyman, Composer; Sam Kenyon. Fairytales on Foot – Site Specific Performance. Bolton Octagon Theatre – Composer & Musical Director. dir. Elizabeth Newman. Tarek also MD’d & performed on the RSC cast recording of A Midsummer Night’s Dream: A Play for the Nation, as well as performing at the BBC launch for the RSC’s 400th Shakespeare Anniversary celebration year of events, and featuring on the accompanying BBC documentary series, The Best Bottoms in the Land. Anita and Me – Birmingham Rep / Stratford East – Ned/Bazzer/Musical Director. dir. Roxana Silbert, Composers; Ben & Max Ringham. The Velveteen Rabbit – The Unicorn Theatre – Man with Suitcase / Pianist. dir. Purni Morell, Composer; Jason Carr. Britain’s Best Recruiting Sergeant – The Unicorn Theatre – Composer & Arranger. dir. Lee Lyford. Tarek also ran a workshop on Actor-Musicianship for The Actor’s Guild, Musically Supervised the 3rd Year Actor-Musician musical at Rose Bruford College, worked as a guest practitioner at The Oxford School of Drama, and co-created the St George’s Hospital bedside micro-panto. 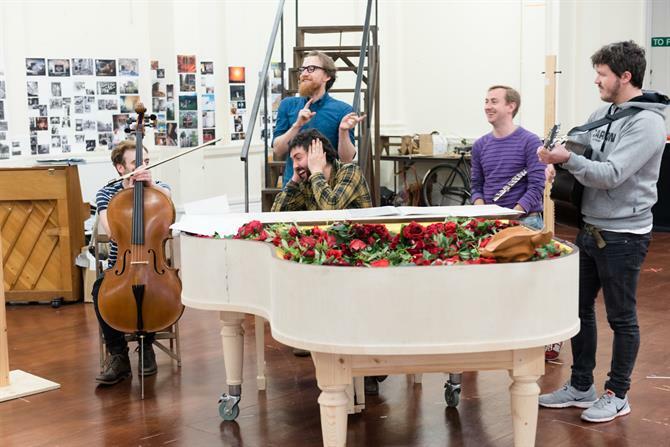 Swallows & Amazons – Bristol Old Vic – Mr Jackson / Musical Director & Arranger. dir. Tom Morris/Pieter Lawman, Composer; Neil Hannon. Love Story – Bolton Octagon – Doctor / Musical Director & Arranger. dir. Elizabeth Newman, Composer; Howard Goodall. Sonnet Walk – Site Specific Performance; Shakespeare’s Globe – Laertes. dir. Jonathan Moore / Mark Rylance. 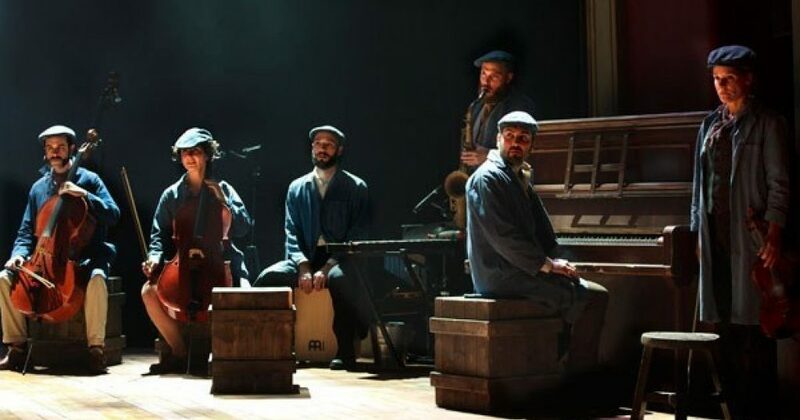 Fiddler on the Roof – Music & Lyrics UK Tour – Avram / Musical Director. dir. Craig Revel-Horwood, Musical Supervisor; Sarah Travis. Larisa and the Merchants – Arcola Theatre – Ivan. dir. Jacqui Honess-Martin. Round The World in 80 Days – Workshop – Runaway Entertainment – Londoner. dir. Sean Foley, Composer; Chris Larner. Arabian Nights – The Watermill Theatre – King Dara Al-Saeed. dir. Robin Belfield, Composer; Simon Slater. The Tempest – The Watermill Theatre – Trinculo. dir. Paul Hart, Composer; Olly Fox. Close The Coalhouse Door – Live Theatre/Northern Stage/UK Tour – The Expert/Music Captain. dir. Sam West, Composer; Sam Kenyon. The Wind in the Willows – The Lowry – Fox/Weasel/Musical Director. dir. Chris Honer, Composer; Jeremy Sams. Chess: The Musical – Michael Harrison Productions, Princess of Wales Theatre, Toronto. Assistant MD/White Pawn/Embassy Official. dir. Craig Revel-Horwood, Musical Supervisor; Sarah Travis. Merlin and the Woods of Time – Grosvenor Park Open Air Theatre – Iwain/Musical Director. dir. Alex Clifton, Composer; David Shrubsole. As You Like It – Grosvenor Park, Open Air Theatre – Dennis/Forester Lord/Musical Director. dir. Nikolai Foster, Composer; David Shrubsole. Chess: The Musical – Michael Harrison Productions, UK Tour – Assistant MD/White Pawn/Embassy Official. dir. Craig Revel-Horwood, Musical Supervisor; Sarah Travis. The Poor Soldier – Theatre Royal, Bury St Edmunds – Bagatelle/Dermot. dir. Colin Blumenau, Musical Director; John Rigby. Oh, What a Lovely War! – Northern Stage/UK Tour – Chaplain/Pierrot. dir. Erica Whyman & Sam Kenyon. A Day in Turkey – Workshop – Theatre Royal Bury St Edmunds – The Singer. dir. Colin Blumenau. The Good Soul of Szechuan – Manchester Library Theatre – Nephew. dir. Chris Honer, Musical Director; Greg Palmer. To Die a Second Time – Arcola Theatre – Dr Edwards/Composer. dir. Teunkie Van Der Sluijs. Sunset Boulevard – Comedy Theatre, West End, ATG – Show MD/Hog-Eye. dir. Craig Revel-Horwood, Musical Supervisor; Sarah Travis. Sunset Boulevard was also nominated for 4 Olivier Awards including Best Ensemble. Sunset Boulevard – The Watermill Theatre – Show MD/Hog-Eye. dir. Craig Revel-Horwood, Musical Supervisor; Sarah Travis.